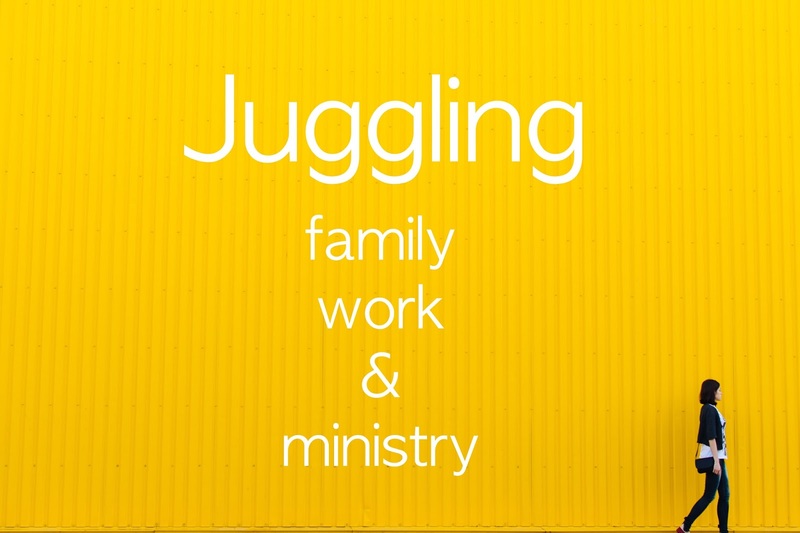 If we're committed to living a ministry-centered life, whether we're in vocational ministry or not, it's essential that we know how to juggle different roles and responsibilities. Many people call this "balance", but I don't think there is such a thing as balance, as if each role and responsibility we have will get equal time and attention at any point and time. I prefer to think of it as juggling: something gets my attention at this time and then something else gets my attention at another time. It's what's getting my attention in all that juggling that matters. We're limited people, so when we consider how to make family, work, and ministry intersect in a God-honoring way, we must remember that we simply can't take advantage of every opportunity and every relationship presented to us. We say "yes" to some things--adding them to our juggling act--and we say "no" to other things, and this is all well and good, but the question I am often asked is how we know the difference and how we manage what we're juggling. First, we have to know our priorities. What spiritual gifts has He given you to use? These questions have been effective in helping me streamline and simplify, because I'm prone to think I'm limitless in time, energy, and relational capacity. I find that the overarching priorities tend to stay the same from season to season, but the specifics of how I manage or pursue these priorities changes quite often. For example, as my boys get older, they need different things from me compared to when they were toddlers. They will always be high priority relationships, but how I mother them and help them changes over time. I am constantly adjusting how I manage my priorities, but my priorities don't change much. It's important to prayerfully evaluate and know our priorities because they will be assailed from the outside--others will present us with great opportunities--and also assailed from the inside--we're prone to self-critical thoughts or comparing ourselves with the good things others are doing. It's easier to recognize that I'm being swayed by outside and inside voices when I have foundational priorities to which I can point back. Second, we must evaluate if our schedule reflects these priorities. We may hold priorities in our heart, but unless we act upon them they really aren't our priorities. This is where time comes in. If we want to honor God through our priorities, we have to be intentional with our schedule. I've found it helpful to think of my typical day in terms of chunks. It's my goal that these chunks reflect the priorities God has given me. They also help when an opportunity is presented to me, because I can immediately see where that opportunity fits within my priorities, or if it is a good opportunity but probably not something God is asking of me. That is what works for me. You may be a homeschooling mom or you may work full time or you may live in a different culture from mine where social relationships happen differently, so your chunks will look different, but the point is to consider how our schedule reflects our priorities and adjust accordingly. One more thing: I have carved out Sunday afternoons as time to go for a walk with women in my church. This has helped me with juggling relational opportunities and has allowed me to get to know women that work full-time outside the home. Third, learn to say an enthusiastic "yes" as well as a grateful but unapologetic "no". I have to tell myself all the time that it's OK to say no. And it is! God has made us all limited people. He doesn't intend for us to do everything, only what He's given us. That doesn't mean He won't stretch us beyond what we think we can handle. That doesn't mean we're in control of our schedules and our priorities and our "yes" and our "no" belong to us alone. He will certainly put us in situations that require trust and dependence upon Him. He will sometimes ask for an enthusiastic "yes" regarding something we don't necessarily want to do. He will ask us to be faithful with the enthusiastic "yes" we've given. But He is not a taskmaster. He does not give a yoke that's too heavy and ask us to carry it all on our own. Don't buy a ton of stuff that you have to organize and maintain. Live simply. Plan ahead. Plan a menu for the week. Have certain days you do laundry and go to the grocery store. Don't clean before people come over. Straighten. They're not going to look at your baseboards. Keep paper products stocked in your house for entertaining. Determine a gift you'll give at all baby and wedding showers. I give The Jesus Storybook Bible at baby showers (that I buy in bulk and when it's on sale) and a cookbook of my favorite recipes at wedding showers. Have a time each week where you and your husband sit down and look at the calendar. Look at the coming week and also the weeks ahead, not just reactively but proactively. Reactive: What do we have to do to get through this week? Proactive: Who are we going to invite over? When are we spending time with friends? What special time might we plan with our children? Write letters to people. I learned this from my husband. If you are encouraged by someone at your church, write them a letter and let them know. Or if someone is hurting and you're praying for them, write them a letter and let them know. This is a easy way to touch base with people. Teach your children to help with chores around the house. Even the youngest child can put their own laundry away or help take out the trash. Deal with mail and papers as soon as they come into the house. Pay the bill immediately. Sign the paper immediately and put it back in the backpack. Always remember the two main things: Love God and love people. Now, it's your turn. 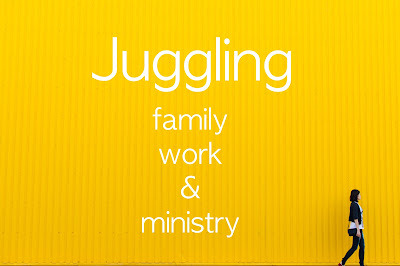 What tips would you add about juggling family, work, and ministry? What questions do you have for me? I will be answering your questions in a future blog post.